GS Bite: Beerwenches, Pilsner and wienerschnitzel…oh my! Ok ok…I know what you’re all thinking…Austrian food? How could that possibly be healthy?? Usually when I think of Austrian food, I think of fried schnitzel, heavy stews, and beer. Lots and lots of beer. Not exactly figure-friendly foods. So when I first heard about the restaurant, “Edi and the Wolf”, in the East Village, I had my doubts. But, having heard good things – I decided to check out the menu online and keep an open mind. And I was pleasantly surprised! So this past weekend, D and I went on a little double date with our college buddy, J and his date, C. The restaurant looks like you’ve entered into some Austrian lodge high in the mountains after a day of snowshoeing. 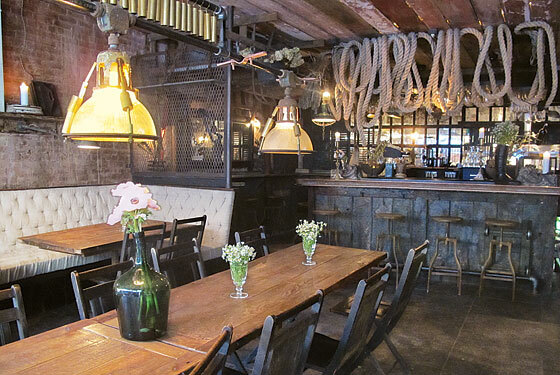 Big wooden tables and rustic decor cover the walls and the lighting is dim and warm. Or as the village voice would say, “Think farmhouse tavern meets crazy grandma’s attic”. After enjoying a delicious glass of Gruner Veitliner (German white wine) while the boys drank Pilsner from giant mugs, we decided to order a bunch of different plates and share. Sharing is a great way to enjoy a bunch of different dishes, while still keeping portions relatively small. Plus, I think it makes the meal a lot more fun and social – not just a meal, but a shared experience (and isn’t that what dining out is about anyways??). We ordered a couple starters including a pickled vegetable/sauerkraut dish, “Alsatian flatbreads” – basically a very thin slice of pizza with a nutty cheese on top and figs — which was a definite highlight, and ribs (I didn’t enjoy these but they smelled delicious). D and I shared a pan-seared seabass on a bed of squash and sunchokes and I asked for a plate of brussels sprouts on the side to get some more greens in (and I can’t resist my sprouts!). The meal was surprisingly delicious and light – perfect for a night out on the town!